I am all about a quick fix in the name of beauty, but unfortunately they are few and far between. Lots of promises are made with very little follow through, but a few stars pop out every now and then that really do what they say on the box – and pretty damn quick smart! 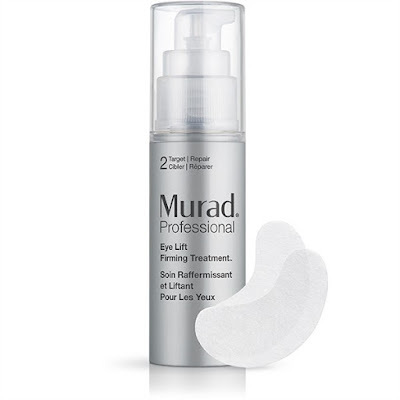 The latest I have been lucky enough to play with comes from the Murad Professional range, a collection of highly concentrated, professional-strength formulas originally developed exclusively for use in the venerable Dr. Murad’s dermatology office. With the highest levels of performance ingredients and the most advanced proprietary anti-aging technologies, Murad Professional formulas give the likes of you and me a powerful alternative to in-salon procedures for dramatically more youthful skin. Love that! The first formula to launch in this professional-strength collection is Murad’s Eye Lift Firming Treatment, and by golly she’s good. It is one of Dr. Murad’s most sought after anti-aging treatments and features highly efficacious concentrations of Hyaluronic Acid, one of the most popular skincare ingredients out there that really delivers. Thetreatment infuses the delicate eye area with an exclusive, proprietary surface-filling and firming technology that instantly lifts, firms and tightens and visibly reduces the appearance of lines and wrinkles. Like, really does. In a Murad study, users instantly saw 2 x visibly firmer skin and 93 per cent noticed their skin was smoother – and I second that. To say this will be my go to over New Zealand Fashion Week and beyond is putting it mildly – it is a lifesaver. Formulated with a potent blend of maximum strength ingredients that are safe enough to use at home, just one go will see a reduction in the appearance of fine lines and wrinkles. The aforementioned Hyaluronic Acid is a big reason for this, and it is an important ingredient in many high-end moisturisers for its ability to provide lasting hydration. Murad creates a proprietary blend of this all-important Hyaluronic Acid, plus firming polymers and oak kernel extract to lift and tighten, rounding out the mix with myrtle extract, Vitamin E, Zinc and various amino acids to also contribute to plump, healthy skin around the eye. Vitamin E, Zinc and Amino Acids in particular enhance resilience and condition the skin for a more youthful appearance – and who doesn’t want that? To use this eye treatment the instructions say to apply 3 pumps of product under each eye. However, I've found this is a little too much product for me so I only use 2 pumps. Then you lightly press in one of the supplied, crescent shaped eye pads and let it sit for 10-15 minutes. The use of the eye pads helps to boost the penetration of the powerful ingredients for optimal performance and results. After the time is up, you pat in any residual product. This beauty can be used 2-3 times per week and I would highly recommend it for a quick fix that works. Oh and it’s available right now for $140, so what are you waiting for?